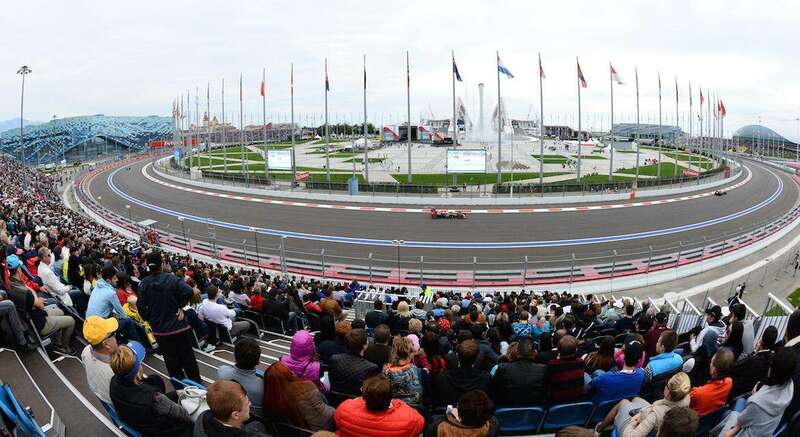 How to get to Sochi for the Russian F1 Grand Prix, plus information on getting to the track and around the city. The next race takes place on September 28-30, 2018. 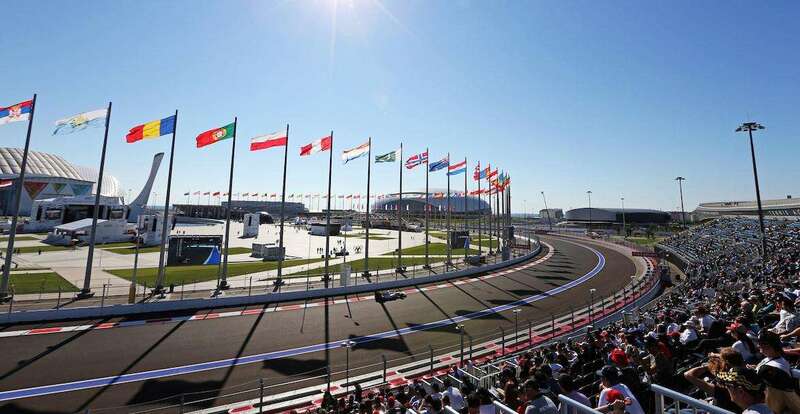 The Sochi Autodrom is located in the Adler district of Sochi, just 7km south of Sochi International Airport (AER), and around 35 kilometres south of the city center. The airport was comprehensively refurbished for the 2014 Winter Olympics, but the bad news for international fans is that it’s hardly an international hub. There are plenty of regional flights, but Western visitors have to transit in either Moscow (with Aeroflot or several other Russian carriers) or Istanbul (Turkish Airlines). Austrian Airlines has discontinued direct flights from Vienna to Sochi. S7 (Siberia Airlines) offer the cheapest fares from London Heathrow: as little as £320 return with a stop in Moscow. KLM offer similarly cheap fares but also involve a change – there are no direct flights from London to Sochi. Flights from Paris are cheapest with AeroFlot via Moscow at around €420 return (this airline offers the shortest transit too.) Cheaper fares with longer connections can be found with KLM for around €340. KLM is also the cheapest (though not the speediest) choice for F1 fans travelling from Frankfurt, with fares starting at €340. AeroFlot offer a wider range of flight options – all with stops – for a slightly higher fare. From Australia, the cheapest return fares ($1700 AUD) from Perth to Sochi are with Emirates, stopping in Dubai and Moscow. Fares of around $2000 AUD are available from Melbourne with Qatar Airways. From the USA, there are flights from LAX to Sochi for as little as $1100 USD with Turkish Airlines and AeroFlot , and from Tampa for a similar fare, also with AeroFlot. Don’t forget that there are direct domestic flights (often quite cheap) to all major Russian cities such as Moscow, St Petersburg, Kazan and Yekaterinburg. Airlines to regularly serve Sochi include Aeroflot, Rossiya and S7. Thanks to the Winter Olympics in 2014, Sochi is a city geared for tourism so its infrastructure is excellent and you won’t struggle to make your way around by public transport. Modern trains ply the coastline from the city center of Sochi to the Adler district in the south, with stops at both Olympic Park (Sochi Autodrom) and the airport. You can even take the same train out to Krasnaya Polyana, Russia’s ‘billion-dollar ski resort’ where most of the games were held. Click here to search in English for Sochi bus and train connections. The city itself also has a good network of buses and trolleybuses, all very cheap and easy to use (most short trips will cost you $1-2 USD maximum). You can hire bicycles for free in Sochi for a small returnable deposit, and much of the city can be explored comfortably on foot. In terms of taxis, both Uber and it’s Russian competitor Yandex Taxi are both popular in Sochi, as it GetTaxi. You can also get your hotel to arrange a taxi to make sure you get a reputable company. The best way to get to the circuit is by train or bus. Extra services are normally put on for Grand Prix weekend. Suburban trains and buses run from central Sochi to the Sochi Autodrom (Olympic Park) station, see map opposite), which is 200 meters from the circuit entrance. The journey time on the train is around 50 minutes from the center of Sochi. Several buses also go direct to Sochi Autodrom, see the numbers below or ask your hotel for information and timetables. Note: if you have a hire car, driving to the circuit is not recommended. Parking in the vicinity is restricted and there are several checkpoints where you will be turned away if you don’t have a valid ticket to park at the circuit. Bus 51 goes from the airport to the center of Adler, whilst Bus 57 also goes to Adler with a stop at Olympic Park (Sochi Autodrom) and Bus 105/124 go to the center of Sochi. A taxi to your hotel (or the Autodrom) is the fastest way, but be warned that the taxi service at the airport can be a little disorganized and you’ll need to be prepared to bargain well. You should expect to pay 400-800 RUB ($7-14 USD) for a ride to Adler and up to 1700 RUB ($30 USD) for a ride to central Sochi. The best idea is to book your transfer in advance, via your hotel. Have you been to Sochi Autodrom? Leave a comment below with your tips! My name is Michelle, I am from Australia and I would like some more information regarding the Russian GP. Do you offer only tickets and accommodation or is it a tour? Also, do you offer pick up from the airport? Hi Michelle, we only provide information for independent travelers, but I understand that a tour could be a good option in Russia. I’d recommend our partners F1 Experiences, who offer several packages for the race. You can add accommodation to your package, and I’m sure the hotel you choose will also be able to offer you an airport pick up. Let me know if you have more questions!